ACT test has been moved to April 2, 2019. This test is for all juniors and seniors who have not taken the ACT yet. Students will be taking the assessment in the gym, and we will start check-in right when the first bell rings, around 8:05a.m. Students need to make sure that they are on time. If students are late, they will not be able to take the test and will be expected to go to their normal classes. Students do not need to print off a ticket for the test. However, students do need to bring some #2 pencils and a calculator if they wish. 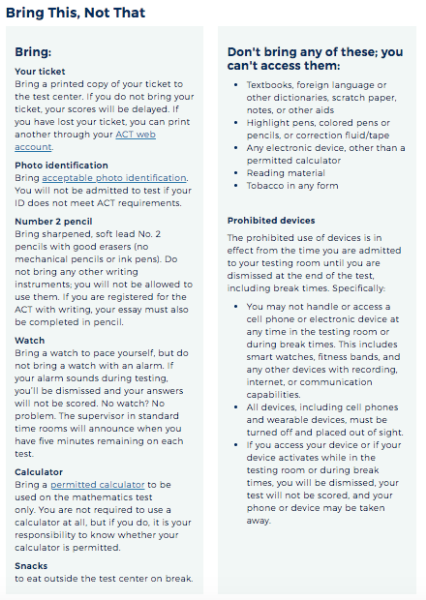 Phones and any type of electronic devices are not allowed in the testing room or during breaks.